I completely forgot the Mars bar. I’m the kind of witch who gives authors in need Mars bars. 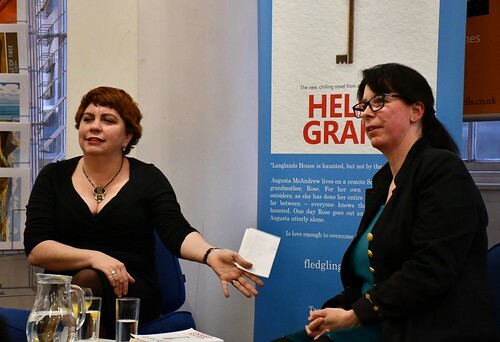 We launched Helen Grant’s Ghost last night. This was the second Edinburgh attempt, after the snow in March, and this time we were successful. 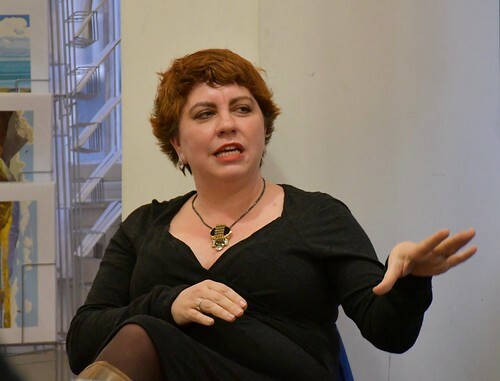 Author Che Golden had mentioned the need for a Mars bar in her reverse psychology sort of invitation to the event on social media the day before. Che was chairing, so clearly felt the need to entice people to come. Online, Helen and Che have been known to call a spade a spade. And worse. In person, Che is disappointingly polite. 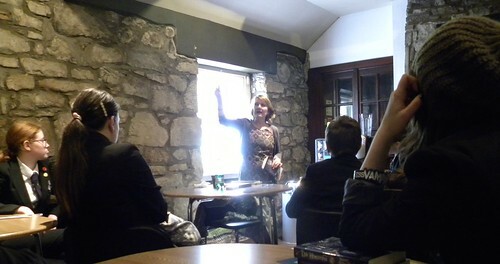 We had a full room at Blackwells, and not just because both Daughter and the Resident IT Consultant came. There were a few authors, like Alex Nye, Joan Lennon, Philip Caveney and Roy Gill. Also a Ghost, except it was just some lunatic covered in a bedsheet, who later turned out to be Kirkland Ciccone gone bananas. And some perfectly normal people. The bananas were later visible on his shirt, which he’d teamed quite nicely with a sequinned jacket. So while everyone else was also beautifully turned out, no one was quite as bananas as Kirkie. Once the silly photographs had been tweeted, Che went to work with a host of questions. Helen continued the fruit theme by mentioning The Pineapple, where you can stay for a holiday, and the deserted ruin nearby, which is one of the many places to have inspired her. She said again how hard Ghost had been to write. The dream would be an agent who reads her new novel immediately, loves it and calls with a book auction offer of £5 million. 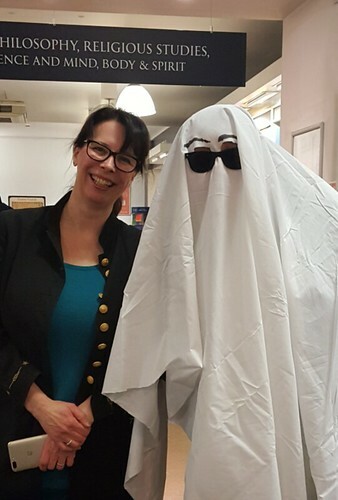 Helen doesn’t want to write more YA, but prefers to work on traditional ghost stories. 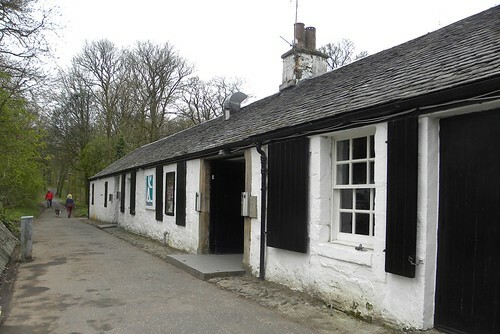 Che reminisced about how on their first meeting Helen took her to Innerpeffray Library, and showed her the leper squint. It’s what she does for her friends, I find. Che also pointed out that while she has read every single book Helen has written, Helen has not read any* of Che’s. This is possibly not true, but a sign of how they insult each other. I occasionally wonder if I shouldn’t have introduced them, but then, where would I learn such a varied vocabulary? Helen sets herself an amount of words to be written every week. If she has worked hard, she might get Fridays off. That’s when she relaxes by visiting solitary places, for the atmosphere. She can recommend graveyards. 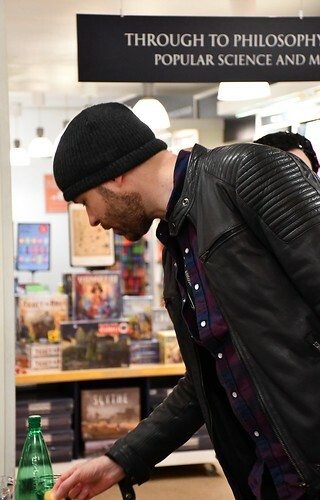 And on that cheerful note it was time to buy copies of Ghost and to mingle and chat. There was wine. After I’d given Mr Grant a quick Swedish lesson, it was time to go home. Which, is easier said than done on a Thursday, with still no evening trains. We lured poor Kirkland to come along with us, which meant his debut on the Edinburgh trams as well as probably getting home considerably later than he’d have done under his own steam. But we meant well. 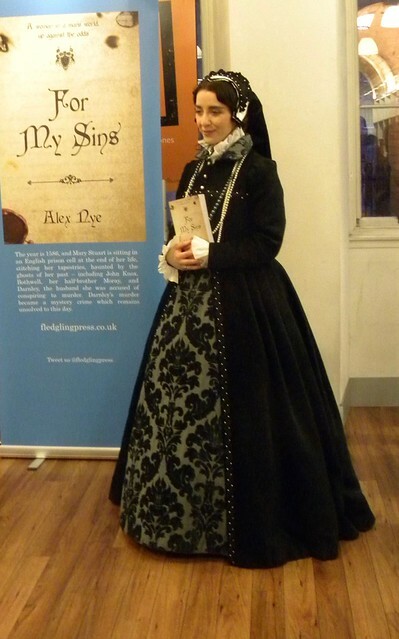 Or so Alex Nye claimed, when she launched For My Sins at Blackwells last night. (She laughed when she said it. So she’s perhaps not entirely serious about it.) 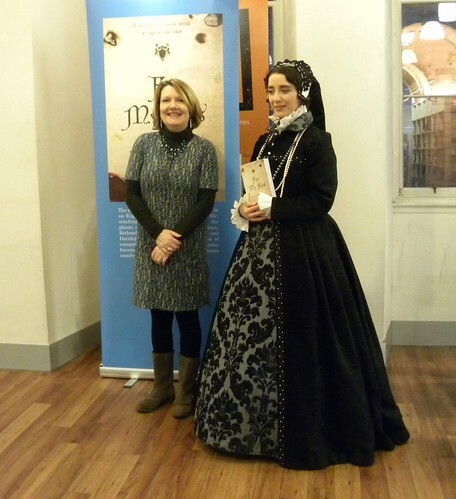 It’s her first adult novel, and it’s about Mary, Queen of Scots. The real Mary was there too, and she was looking good for her age. Actually, on such a dark and stormy night when the rest of us were pretty drenched, I have to point out that Mary looked both dry and beautiful. As I ran in, Tesco prawn sandwich in hand, Alex and her publisher Clare were already there, and Mary turned up soon after. She posed for photos like Royals tend to do, and I believe she even showed off what was under her skirt. Honestly. I ate my sandwich, turned down the offer of wine and was rescued from dying of thirst by the lovely Ann Landmann of Blackwells. We admired the book, which has unusually nice looking pages. I know this sounds strange, but it does. 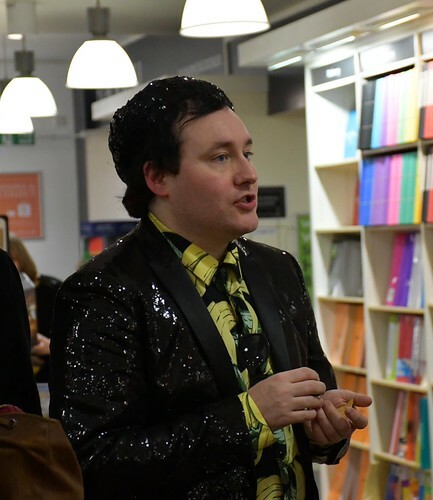 Several other authors turned up to celebrate, among them Kirkland Ciccone wearing a rather loud outfit, Roy Gill who looked suitably handsome, Gill Arbuthnott, Philip Caveney (or was it Danny Weston? 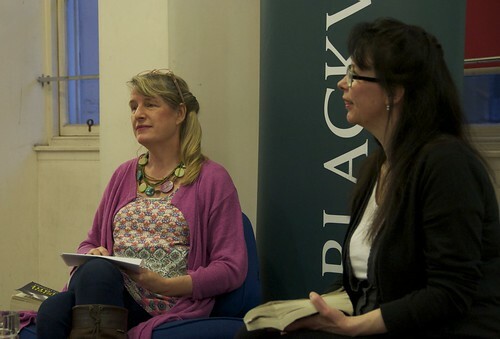 They look so alike…) with Lady Caveney, and then Kate Leiper came and sat next to me again. 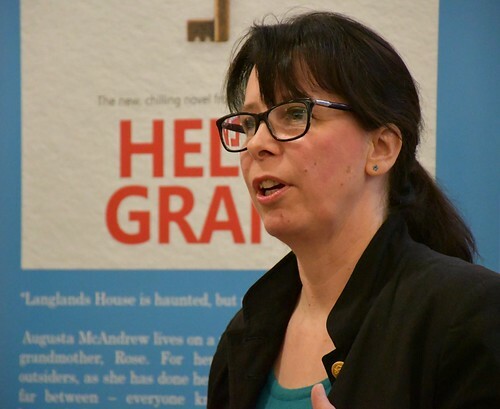 Alex talked about her love of Scottish history, and for Mary, about her research, and walking round Edinburgh for two years (that must have been tiring) to see the places Mary went, and visiting all her castles. And 28 years on, the book is finally here. Luckily Alex has managed to get hold of Mary’s diary from her time ‘in jail,’ which must be considered a bit of a royal scoop. 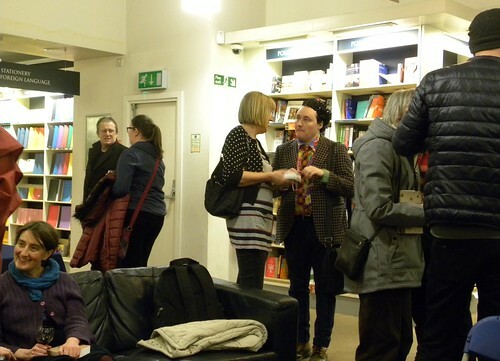 There was a signing afterwards, and much literary gossip. It was almost a shame some of us had to go home, but I couldn’t leave my chauffeur in the Park&Ride all night. I’m just over halfway through the book so far, and I have a dreadful feeling this isn’t going to end well. Yes, what’s the difference? 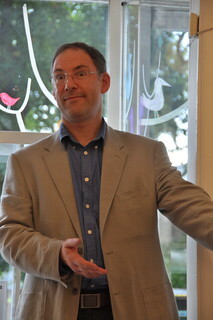 That was one question at the event with Roy Gill and Paul Magrs yesterday. According to Paul sci-fi is something that could happen, given certain technical circumstances, while fantasy just couldn’t. I have never seen the Imagination Lab so full before. They had to keep carry in more chairs for people to sit on. I’d been hoping to learn how on earth you should pronounce the name Magrs, and from what my elderly ears picked up, it sounded rather like the title of Paul’s book, Lost on Mars. So, Mars by Magrs. Paul was there to talk about his Space Opera, set on Mars (and no, it couldn’t be moved to Venus just because the publisher already had one Martian book on the go). He’d been inspired by Laura Ingalls Wilder’s Little House on the Prairie books, as well as by Ray Bradbury’s sci-fi. Apparently many authors treat writing like going to school, although I’ve never heard this before. So Paul started writing Lost on Mars on September 1st and sat at his kitchen table with his newly sharpened pencils until before Christmas, occasionally standing up. Roy conveniently dreamed the Daemon Parallel. He’s someone who puts his ideas in a notebook, and this sat there for several years until he got desperate. The dream gave him the weird grandma, and to make her truly odd he decided she was going to want to bring her son back from the dead. As the chair for the evening said, the two books seem quite different, but actually have a lot in common, like the grandmas. She asked them if the main characters could have been a different age than Paul and Roy made them, but they felt not. There is something about that age where they are old enough to be able to do what they need to do, but also young enough that they don’t act like adults. According to his old diaries, Paul has wanted to be a writer since he was ten. When his school was closed due to snow, he spent the mornings writing a novel, and the afternoons writing Doctor Who episodes. Paul read chapter five, which is where the grandma in his story has to have her artificial leg seen to. It almost seemed creepier than when reading it in the book. Roy read the meeting between the teenagers and the weird lawyer from Werewolf Parallel, and I’m not even going to mention the odd chin. (I didn’t mention it!) His daemons are all very random, and the Jenners episode stems from him getting lost in this posh shop as a small boy. But it’s all fine, and I made it out nice and early to have my copy of Lost on Mars signed. My Daemons had already been done. 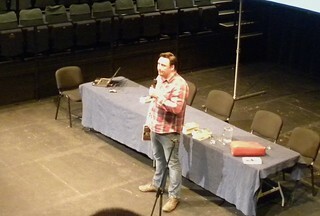 Yesterday saw the long awaited birth of Kirkland Ciccone’s first ever Scottish YA book festival Yay! YA+, and I really appreciate his thoughtfulness in arranging it for the day on which I celebrated my first year in Scotland. 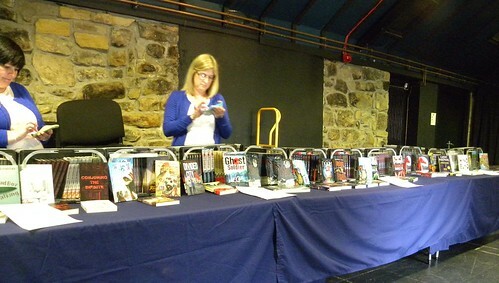 Kirkie had lined up ten teen authors, 200 teens and one tardis-like venue in the shape of the Cumbernauld Theatre. In Cumbernauld. He also arranged for the lovely people of Scotia Books to come and sell books, and between you and me, they not only had the good taste to like my sense of humour, but their mobile shop was the best I’ve seen. 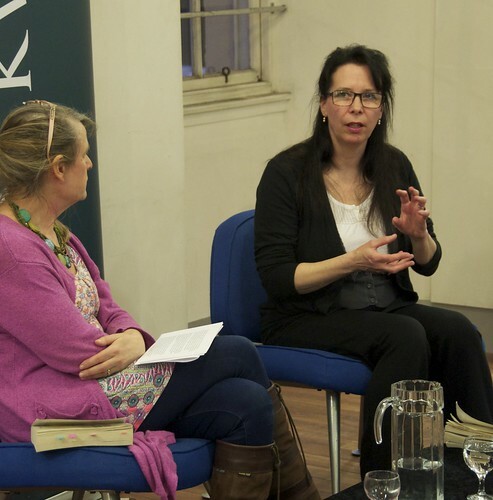 Once we were all in, Kirkland explained how some authors would ‘be taken out’ and split up into tiny pieces. Yeah. I don’t think he meant that literally. He wanted to say that six of the authors would be ensconced in their own little rooms (=bars and subterranean dressing rooms), where smaller groups of the audience would come to hear them read from their books, or talk about their writing, or anything else they might want to do. Ten times. Eek! 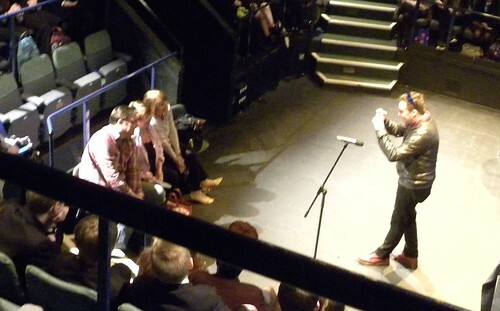 Meanwhile, Cathy MacPhail, Theresa Breslin and Barry Hutchison stayed in the main theatre and each had 25 minutes in which to charm the half of the audience left behind, which they did with real style. Twice. 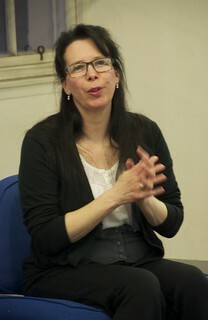 Multi award-winner Cathy started by sharing the trailer to her film Another Me, based on a nightmare she once had. 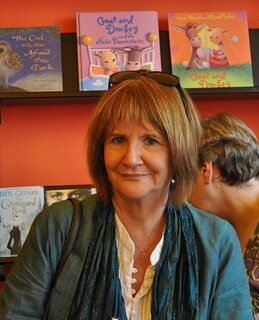 She can see a story in anything (perhaps because she’s from Greenock, where you know everyone), and Cathy is surprised she writes such scary books, when she really is such a nice person. Theresa brought her gasmask, which looked quite uncomfortable to wear, and some shrapnel from WWI. She reminisced about travelling to America a month after September 11th, and hearing he same words then, that soldiers used a 90 years earlier to describe why they went to war. Some things never change. She read a tense bit from Remembrance, before telling us how good it is to write YA for teens, as they will read everything, with no set ideas of what a book has to be. 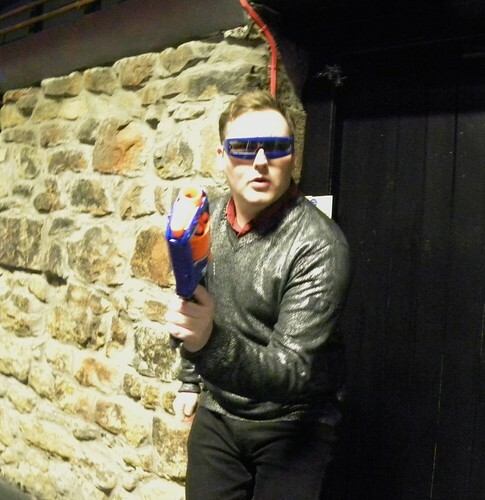 Last but not least, Barry Hutchison talked about his fears, so it was back to his perennially entertaining tales of ‘Death and Squirrels’ and his childhood concern whether the dead squirrel was ‘proper dead’ or might come back and attack the young Barry. I can listen to his tale of weeing in the kitchen sink as many times as he will tell it. Or about his friend Derek. Barry read from The 13th Horseman, which must have made half the children want to buy a copy. 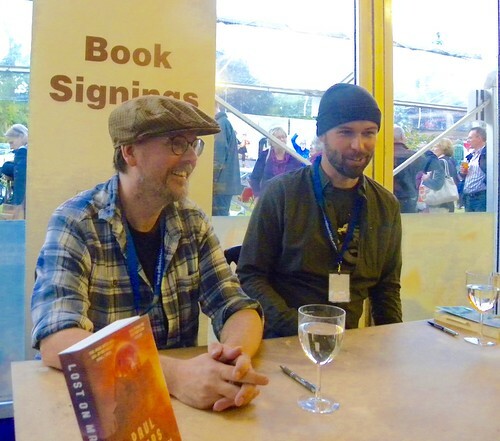 There was lunch – with cupcakes and fruit – and signings and even some time for hanging out. Keith Charters turned up, and admitted to a life-long ignorance of sharpies. That’s not why he came, but, still. I contemplated stealing Kirkie’s sharpies-filled lunchbox, but didn’t. 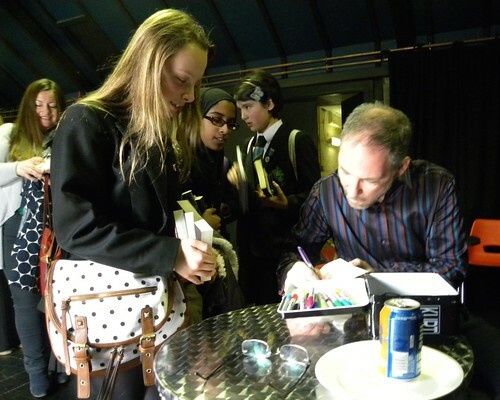 After the eating I aligned myself with half the group from Cumbernauld Academy for my rounds of the nether regions of the theatre, and they were both lovely and polite as well as interested in books. 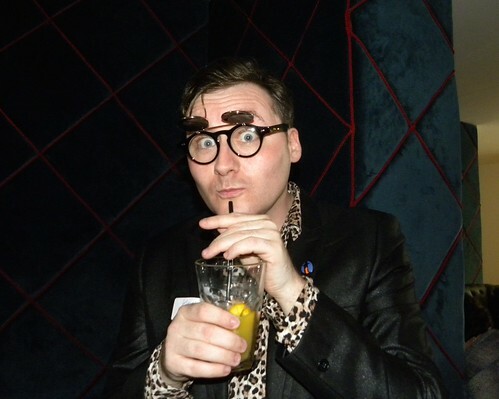 Although, I joined them after their session with Linda Strachan – in the bar – which unfortunately meant I actually missed Linda’s seven minute show, as I was sitting out the empty slot with Alex Nye (one school was missing). 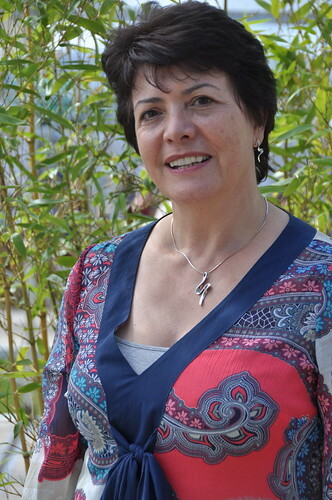 And you’ll think I have something against Linda, since she is the only one who does not appear in any of my – frankly substandard – photos (photographer had better things to do…). 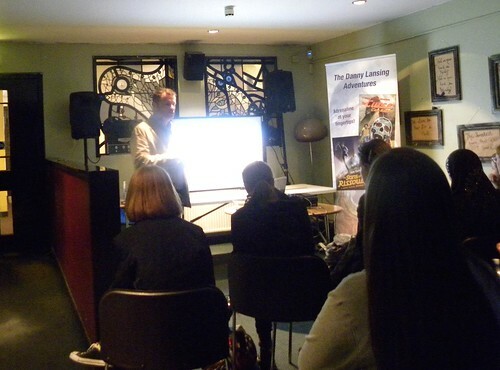 Anyway, Alex spoke about her cool books, Chill and Shiver, featuring snow and ghosts, before we went to join Matt Cartney who not only sat in a warm bar, but who had been to the Sahara. Admittedly, he had been to Hardangervidda as well. His Danny Lansing Adventures (Matt loves adventures!) are set in sand, and snow, and wherever else Matt might find inspiration. 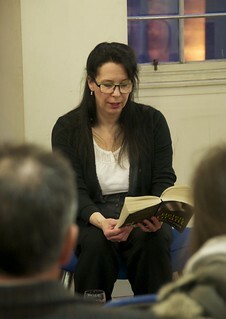 Lari Don read from Mind Blind, which was her first non-fantasy, for older readers. She had been troubled by not being able to solve problems with magic. Lari is very good with school children. We then found Roy Gill in one of the dressing rooms, and the poor man was only allowed five minutes with us, so raced like crazy through his werewolves and a reading from his latest book. 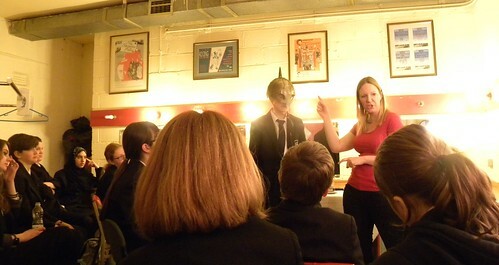 We finished in another dressing room where Victoria Campbell had brought her Viking weapons. 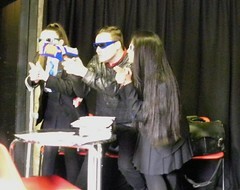 Just imagine, small basement room full of young teenagers and some – possibly not totally lethal – weapons. She dressed one volunteer in a spiky helmet but didn’t let go of either the Dane Axe or the sword. Victoria asked what the best thing so far had been, and my group reckoned it was the selfies! Apparently some of her Viking interest comes from a short period living in Sweden (good taste). Before we left her, there was an almighty scream from – I would guess – Roy’s dressing room. Ever the optimist, Kirkie had scheduled a panel session at the end (a full 20 minutes! 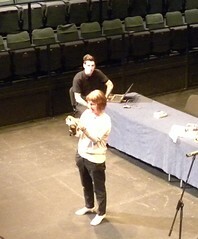 ), chaired by Keith. Unsurprisingly, the authors had different opinions on nearly everything. But the questions were good. Very good. This was one fine audience. Theresa brought out a gift for Kirkie, which might have been a chocolate boot. 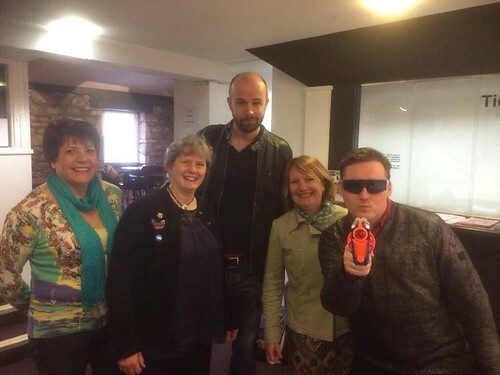 And while the panel wound things up, he and some of the others hastily got ready to run off to Edinburgh, where they had an(other) event to go to. All good things come in twos. The very lovely Barry Hutchison offered to remove me from the premises, on his way home to Fort William, which meant I was able to actually leave Cumbernauld – something that had worried me considerably earlier in the week. He set me down outside the newsagent’s after some nice conversation, and a secret. My verdict of the day is that if we can only get Kirkland to speak less loudly in places, this worked really quite well. Might let him repeat it, if he can find more dark corners in which to stash Scotland’s finest. Do you remember Daemon Parallel, where unspeakable things happened at [maybe] Jenners department store, and where Cameron realises his granny is not quite like other grannies? Crazy, loopy, insane. Quite old, too. As I suspected he would, Roy Gill has written a sequel, by popular request. It’s a good thing he did. 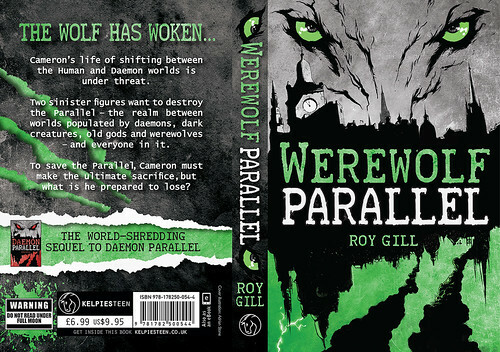 Not only was Cameron still alive at the end of the first book, but I’d say Werewolf Parallel is even better. There is a wicked astrophysicist. Shame, really. There are grey blobs, ancient gods and lots and lots of weird and wonderful things all over Edinburgh. I’ll have to study my surroundings much more carefully when I’m next at Waverley station, for instance. All those secret railway routes. And as you can guess from the title, there are a fair number of werewolves, along with a few surprises on the wolf front. Very enjoyable, and I wouldn’t put it past Roy to accidentally write a third Parallel novel. After all, he didn’t kill everyone off this time, either. If Edinburgh is up for it, then so are we. is how Helen Grant describes her younger self, in the days when her pudding basin hairstyle made people think she was a boy. Well, I don’t think they’ll make that mistake any more. Helen is a beautiful woman, who feels that Hannibal Lecter got a bit tame in the end, and that’s not how she wants to write her books. 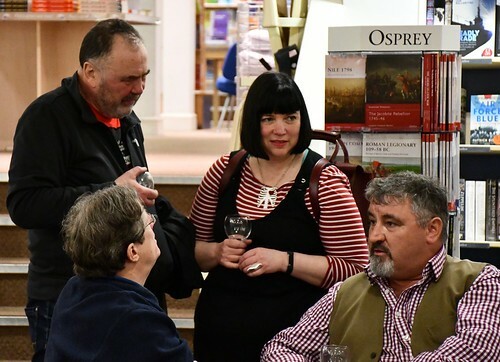 The Bookwitch family were part of the discerning, quality audience at Blackwell’s in Edinburgh on Tuesday evening, there to launch Urban Legends. 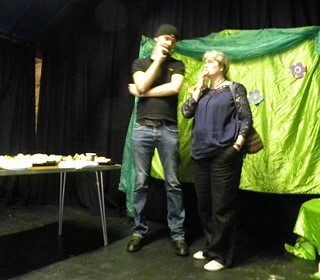 Admittedly, Son only popped in to say he couldn’t stay, but it was still somewhat of a witchy family gathering. The way I like it when an author reads from her book and chooses the bit where the killer eases off the strangling of his victim, because he has to have a hand free to grab his axe. 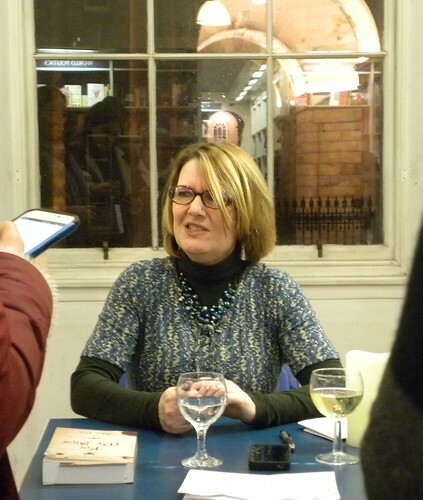 Even the lovely Susy McPhee, whose task it was to chat to Helen and ask her difficult questions, admitted she had been rather terrified of Urban Legends. Whereas Helen actually reads her own book in the bath (one assumes to relax…), which is why her copy looks decidedly dogeared. If Urban Legends was a television programme, Susy said she would have switched off when they got to page 38. 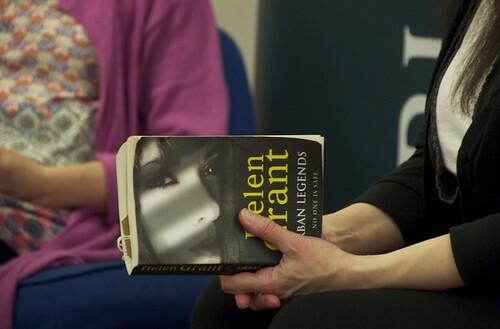 Helen admits Urban Legends is not for younger readers. She likes creepy, not bloody, and doesn’t set out to be deliberately gross. Here she used the word eviscerated, which Susy said she’d have to look up. 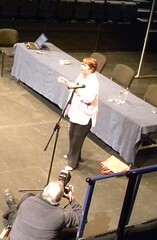 And to make her pay, Susy had prepared some tricky words for the audience to test Helen on. Mine was vivandiere. Helen ‘cheated’ by knowing Latin too well. This might be a trilogy, but Helen won’t rule out more books. She likes Veerle’s world, and would love to write more. She herself has tried a lot of what’s in the books, visiting sewers and getting herself inside a forbidden church, for example. Her favourite is the definitely-not-allowed visit to a former factory, which she put most of into her book, in a most charming way… She likes a high body count. On that note Susy brought the conversation and the questions to an end, and we mingled over the wine and the literary discussions. I introduced the Resident IT Consultant to the man [Roy Gill] who did interesting things to Jenners department store in one of his books. Once I’d secured a signature in my copy of Helen’s book, we left in search of a bus to take us to the tram, which took us to the car and home. And they have gone live! I might have whispered about Kirkland Ciccone’s grand YA plans before, but now the website is publicly available and it’s actually got stuff on it. Not too much dust yet, either. The day we do have is April 24th and I’m so looking forward to it. I have demanded to revert to being 14 again. If that’s not possible, I’ll have a press pass (which will probably be home made by Kirkie, but hey, as long as it gets me in). This time round it will be for schools only. It’s a good way to start, and will mean larger audiences than the old-fashioned way with organic ticket-buying individuals. But I would say that if you are of the organic persuasion, I’d pester. Like crazy. Or there is always gate-crashing. I’m quietly hoping this Yay! 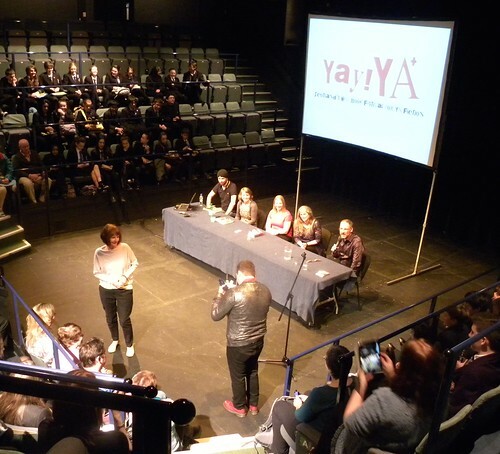 YA+ will be a success, and that it will grow into something big, and regular. Because, as I said, we have lots more authors were these came from. This year’s list contains lots of my favourites, and erm, no one that I hate, plus a couple of unknowns (to me). So that’s all pretty good.